Mumbai: India’s largest software services exporter Tata Consultancy Services Ltd (TCS) received a significant boost to its business from Citigroup Inc., its largest client, in the fiscal second-quarter, a signal that technology spending is recovering in North America. That’s based on the firm’s latest quarterly operating metrics, including an increase in revenue contribution from North America and a rise in the contribution of the banking, financial services and insurance vertical (BFSI).The contribution of Citigroup to TCS’ revenue jumped from 5.7% in the quarter ended June to 6.8% in the September quarter. 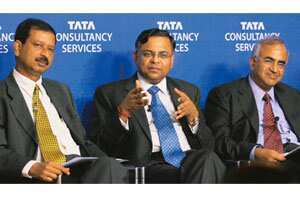 On a sequential basis, TCS recorded revenue growth of 3.2% from Rs7,207 crore to Rs7,435 crore. “It looks like the numbers are pretty self explanatory. Citi, as the largest client, had a fairly large contribution to make to performance," said the analyst with a foreign brokerage, who did not want to be named as he’s not authorized to speak to the media. “If on a sequential basis the ...revenue contribution from the top client has gone up by 1.1 (percentage points), then it has to have happened in the quarter just ended, which is a fairly significant jump," he added. Overall revenue from North America as a geography went up by the same proportion, from 52.3% of overall revenue in the June quarter to 53.4% in the September quarter. Revenue from the BFSI vertical also rose by 1.1 percentage points, from 43.9% to 45%. TCS boosted its business ties with the US banking group in October 2008 when it acquired Citigroup’s business process outsourcing unit in India, Citigroup Global Services Ltd, which employed nearly 12,000 people and had revenue of about $278 million (Rs1,287 crore today) in 2008. Along with that acquisition, TCS also entered into a service contract with Citigroup, which was at that point valued at $2.5 billion spread over nine-and-a-half years. Along with the acquisition, TCS also added some financial services technology platforms to its existing portfolio in the vertical. TCS chief financial officer S. Mahalingam said the acquisition of the Citigroup unit had worked out well. “It’s doing very very well. It’s margin accretive." Asked if the same growth would have been possible without the acquisition, Mahalingam said: “The growth did come from Citigroup. We are quite happy with the growth in Citigroup and also the margin it has delivered." However, he added, “A substantial part of the growth has come from the organic business of TCS." Specifically asked about any particular client helping the September quarter’s performance, Mahalingam said that “the 5% volume growth we have seen is right across various segments", but emphasized the growth in the BFSI vertical. Other verticals that recorded sequential growth were life sciences and healthcare (0.3%), besides energy and utilities (0.1%).